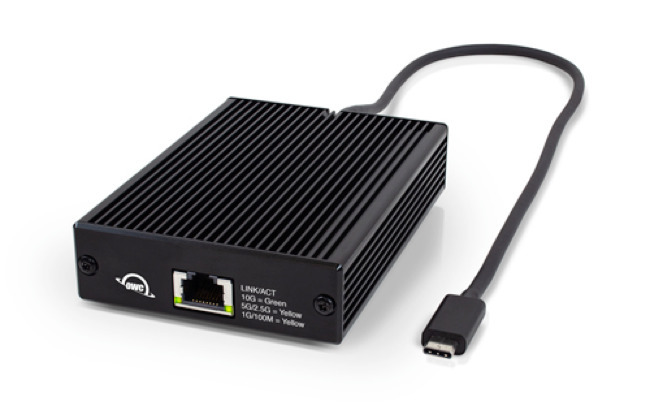 Aftermarket Mac upgrade vendor OWC has launched its Thunderbolt 3 10G Ethernet Adapter, allowing users to connect their Mac or MacBook to a 10-gigabit network at the same maximum network speed offered by the iMac Pro. The Thunderbolt 3 10G Ethernet Adapter, as the name suggests, can connect to a 10G Base-T network, as well as supporting slower-speed connections for 5G, 2.5G, Gigabit, and 100 Base-T networks. On one end is an Ethernet port, with link lights changing color from green to yellow depending on the speed, while the other has a 19.6-inch Thunderbolt 3 cable attached that provides power as well as transferring data. It is noted the Thunderbolt 3 cable is captive, namely it is securely connected to a hidden port within the enclosure. This means that, in the event the cable is damaged, it can be replaced without changing the entire unit. It is a compact unit measuring 4.5 inches by 3.1 inches, and 1.1 inches thick, excluding the cable, and is claimed to have a "rugged" enclosure. Weighing just over half a pound, the lightweight and small adapter is highly portable, making it extremely useful for those on the move who need to connect to a wired network. Taking advantage of the 40-gigabit per second bandwidth of Thunderbolt 3, the adapter will work with devices running macOS 10.3.4 or later, and doesn't need to have a driver installed. It will also work with Windows desktops running Windows 10 64-bit (version 1709) or later, again without needing a driver to be installed beforehand. The OWC Thunderbolt 3 10G Ethernet Adapter is available from OWC directly, priced at $187.99.